Take a ranger guided boat tour from Kabetogama visitor center and a hike, such as the Blind Ash Bay trail from the Ash River visitor center. If you have a boat, or can rent one, take the boat out on the lake and explore the various coves and islands. Fish and spot wildlife. The hub of such activity is around Kabetogama. When I told my wife Loretta we need to get on a boat to enjoy Voyageurs, it immediately made this park a lot less attractive for her. She and water activities don’t mix. Renting a small boat to explore was out of the question for us, so we took a ranger guided tour from Kabetogama to Kettle Falls. She didn’t even take Dramamine for the three hour round trip, very brave of her! The September day started cloudy and a bit windy, as 15 of us, Captain Gary, and our guide, Lindsay, set out on a placid lake. Lindsay started to tell us about the American Bald Eagle’s nest as we pulled away from the dock. 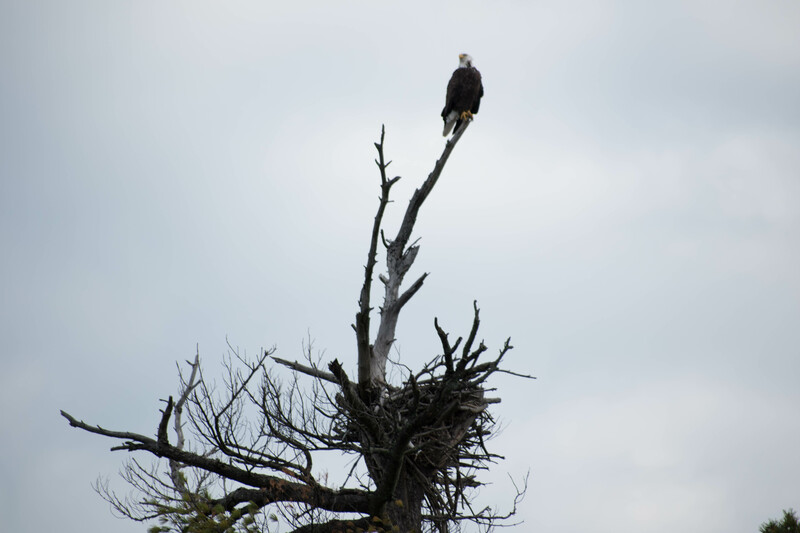 Soon after, Captain Gary slowed the boat and pointed to the right – an eagle’s nest with a young eagle perched on a top branch. This eagle is brown because she was too young to have the signature white head. This was a great start to our five and half hour tour! 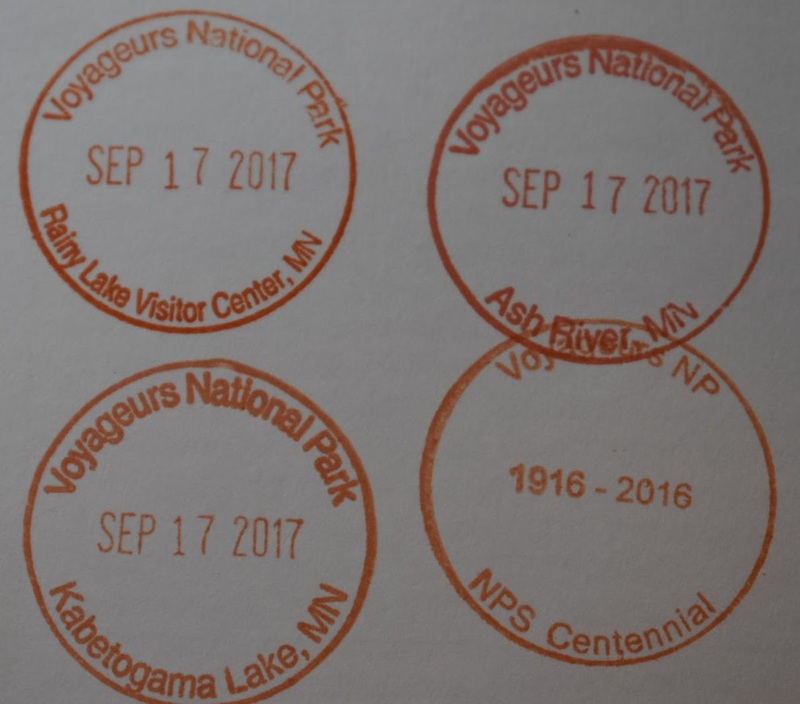 Every National Park features something unique and Voyageurs is no exception. It is all about the lake. Minnesota is the land of 10,000 lakes (it says so on the license plate), so it’s not surprising to find a National Park for lake scenery and recreation. Recreation at Voyageurs is a four season activity. Water sports in the summer, ice fishing and snowmobiling in the winter, spectacular view of fall foliage, and spring thaw brings new life to the lake. If you want to get away from it all, boat across Lake Kabetogama to Kabetogama Peninsula and hike the trails. National Park Service provides canoes at some of the inland lakes and waterways (reservation required) for guests to use. You won’t find many people there. Voyageurs is right on the Canadian border, far away from any major city. The nearest town is International Falls, with 6,000 inhabitants and known as the coldest place in continental United States. With a big lake and only 240,000 annual visitors, it’s never crowded. We had an excellent day on the ranger led tour, especially the wildlife. 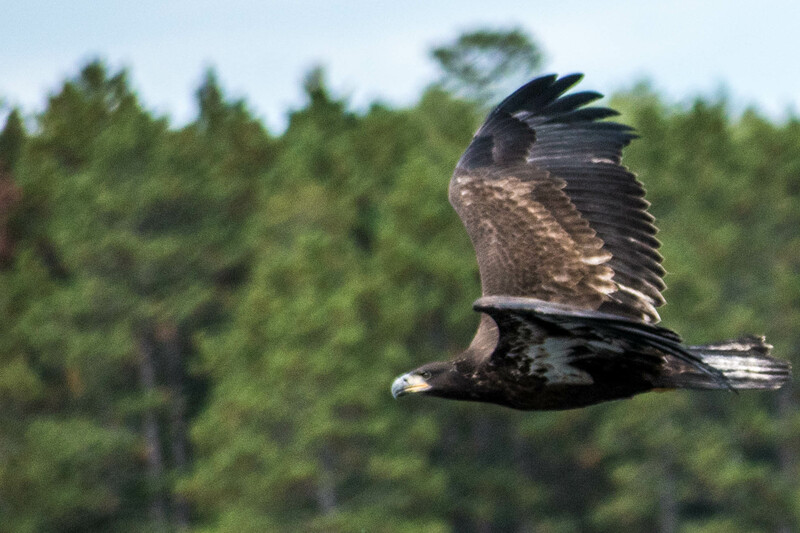 Plenty of eagle sightings, both young and mature. 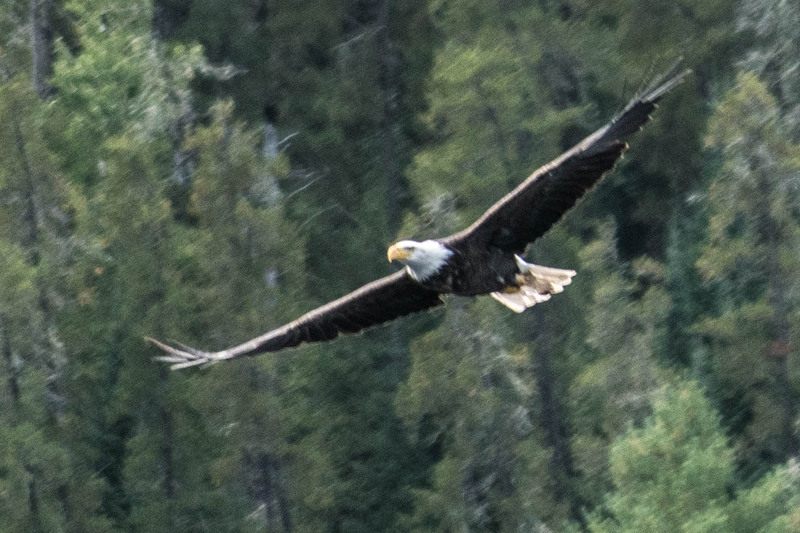 At one point, we saw six eagles flying around us as people (including me) happily snapping pictures. 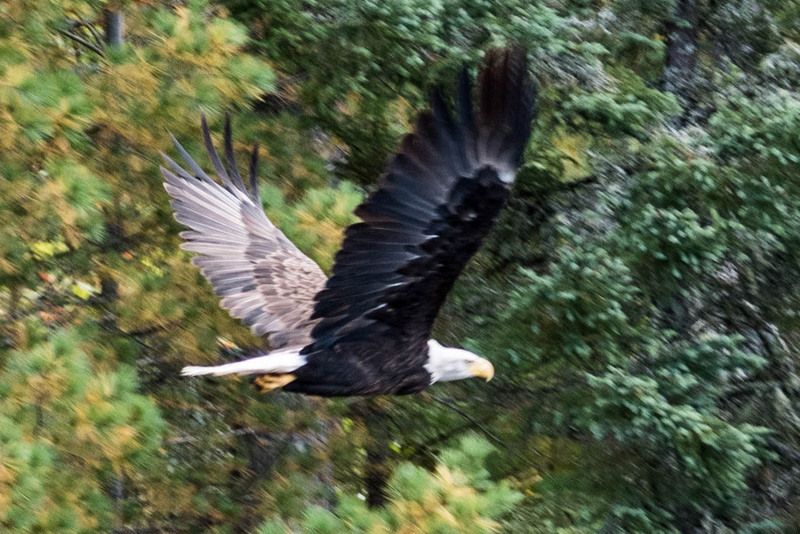 There was a six inch fish floating and one of the eagles lowered his strong claws and grabbed it. 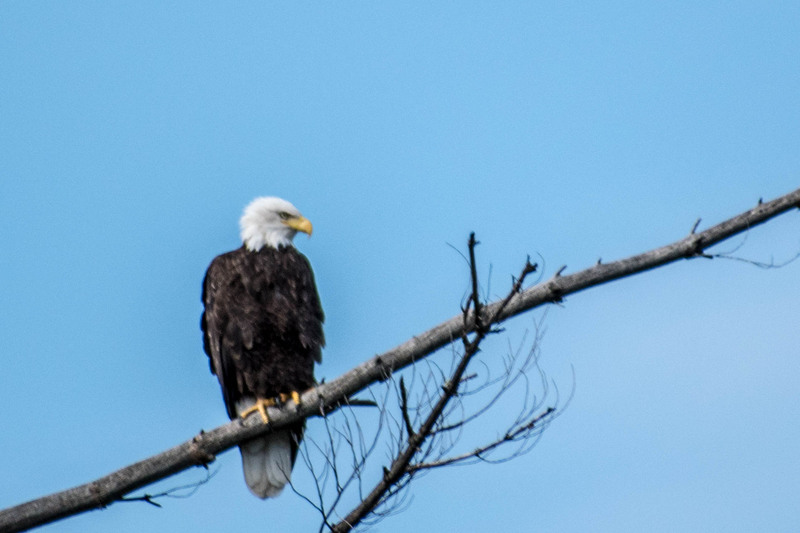 The ranger speculated that the fished was floating because an eagle got it earlier but lost the grip, but the fish was dead by then. 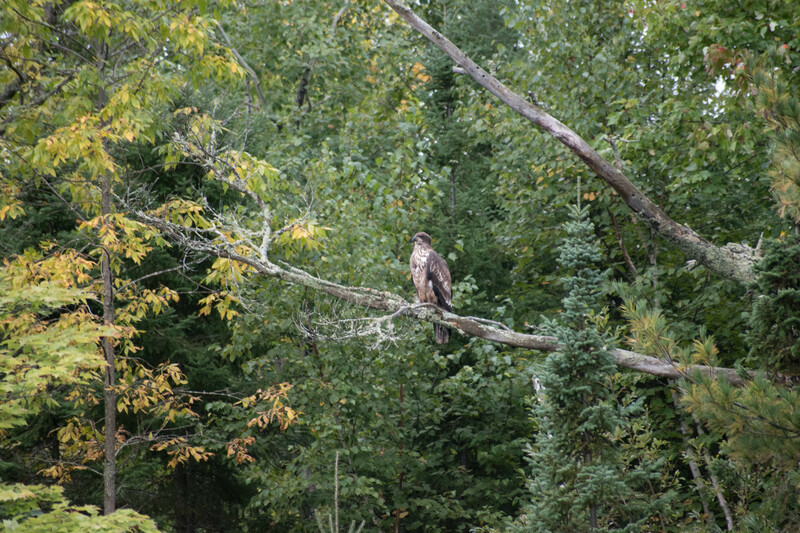 We saw around 30 eagles during our trip, each one more majestic than the last. Ranger Lindsay told us all about how they track the eagle population with tags. 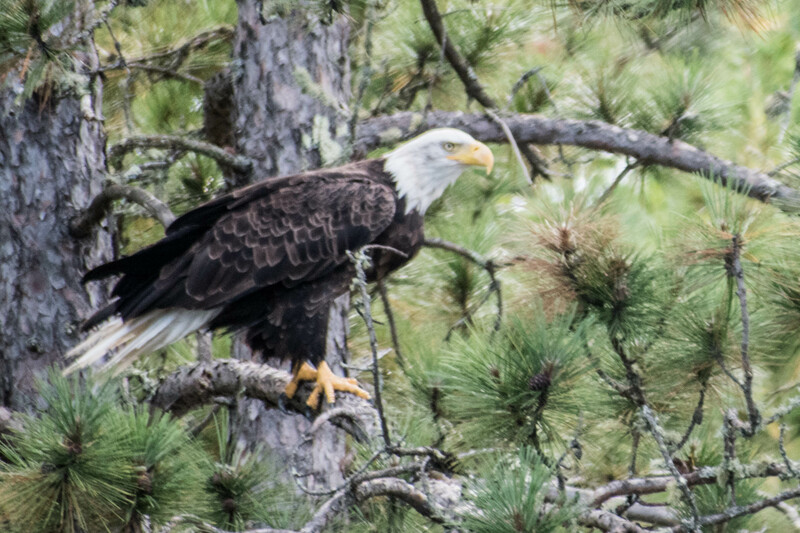 An adventurous person climbs the tree with an eagle’s nest shortly before the baby eagles fledge, lowers them to the ground in a sack so the naturalists can tag them, take blood samples, and look at the overall health before he puts them back in the nest. These nests are big. A human baby can easily fit. 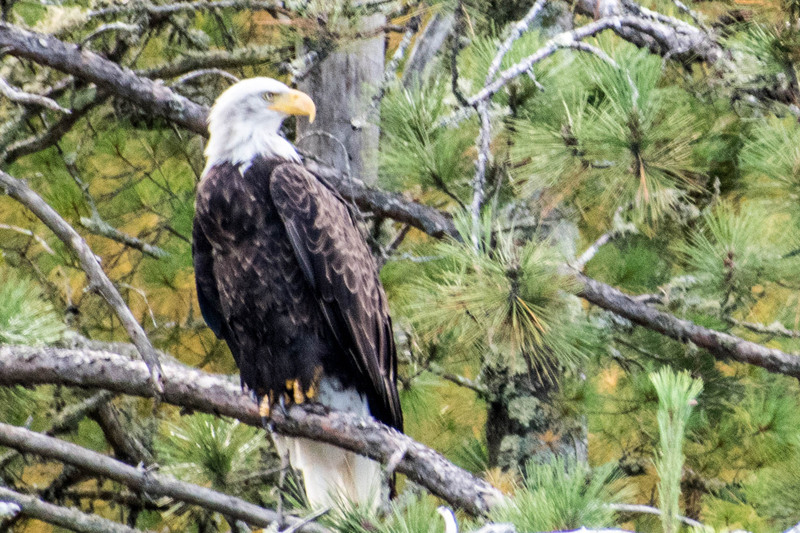 Question: If an American Bald Eagle flies over Canada, does that eagle become a Canadian Eagle? Otters, Loons, Geese, Snake and Moose? Captain Gary slowed the boat and pointed to the shore where three river otters frolicked on a rock. 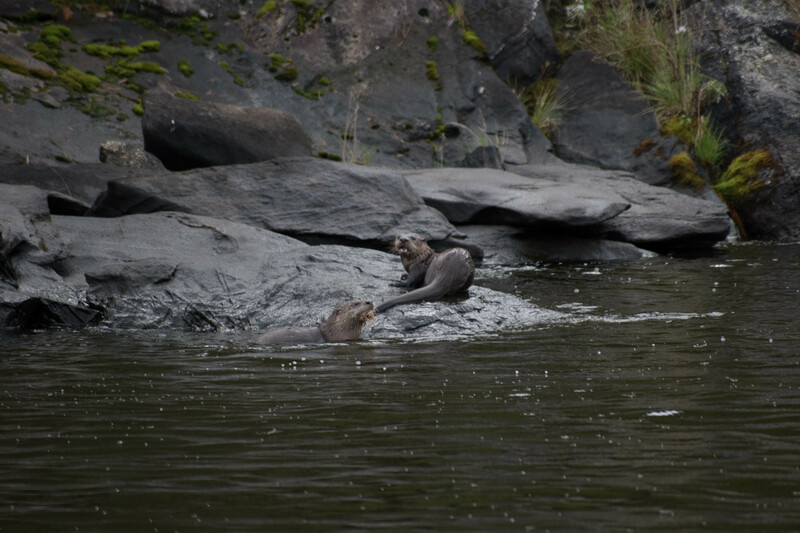 As the otters moved around, we followed at a respectful distance. They seemed to intentionally put on a show for us. What a treat! Overhead, flocks of Canadian Geese were flying in formation, except they seem to be going north in September? Go figure. 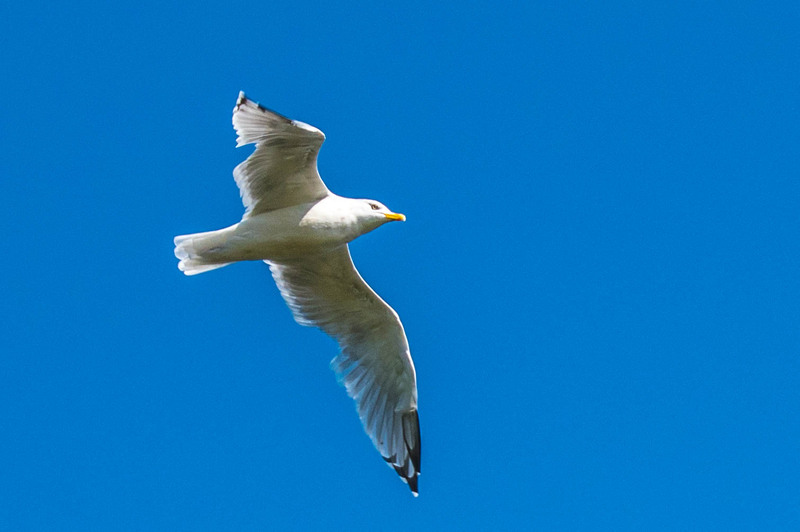 Captain Gary spotted several loons with its pretty pattern mixed in with white seagulls floating on the lake that was shimmering from the afternoon sun. How he saw that was beyond me, but he was the expert. The loons are pretty, especially its glistening eyes, just looking at us. As Ranger Lindsay led us on a short walk to Kettle Falls, she pointed to the side of the trail and said “Look!”. The lady next to her screamed, jumped, and ran away and yelled “snake!”. There was a small snake trying to ingest a frog with its legs hanging out of the mouth of the snake. 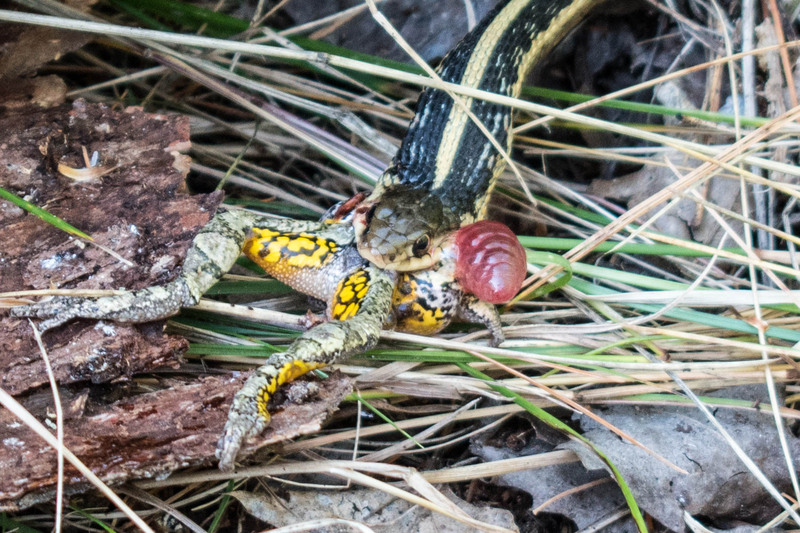 The snake was quicker than this frog – nature at work. I really wanted to see a moose, but with only 40 or so moose in the park, the closest I came to a moose was at the visitor center. 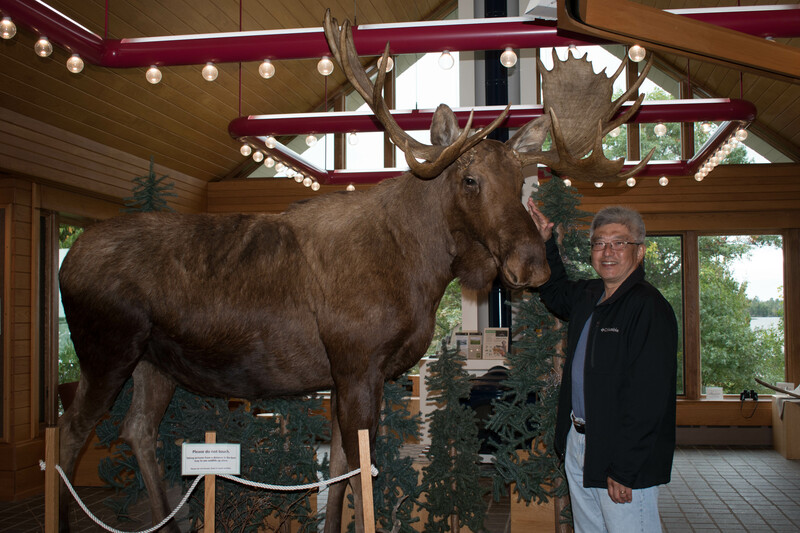 The ranger said the moose were in Kabetogama Peninsula, away from most people. 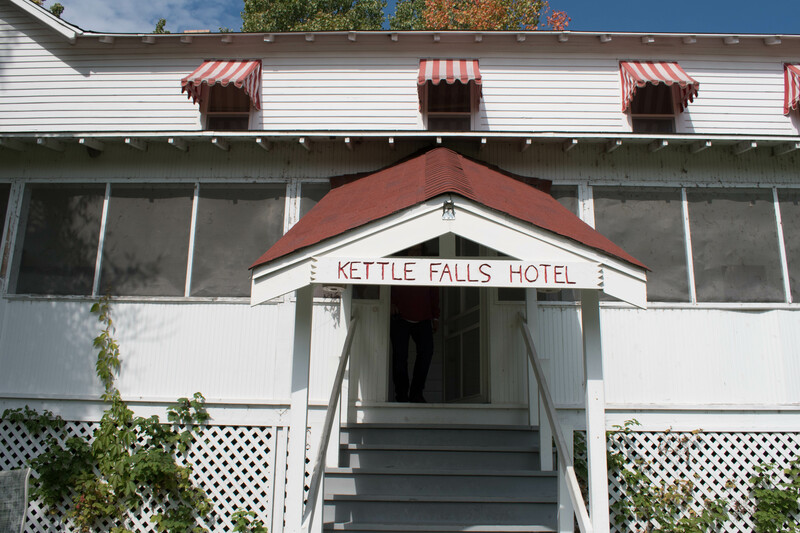 The Inn at Kettle Falls provide the only lodging in the park, but you need a boat to get there. It’s rustic and charming, with emphasis on rustic. The bar is unique because it has a slanted floor, resulted from building without foundation. The Park Service re-enforced the rest of the building but left the slant at the bar for historical reasons. If you sat at the both in the bar, your mug of beer will slide across the table. The burger I had for lunch at Kettle Falls was outstanding and the onion rings cooked just right, what an unexpected treat! We took the short walk to the dam at Kettle Falls, one of two dams on these lakes, as Ranger Lindsay gave us the history of these dams and the current delicate management of lake levels today with Canada. The other dam is on the Canadian side. 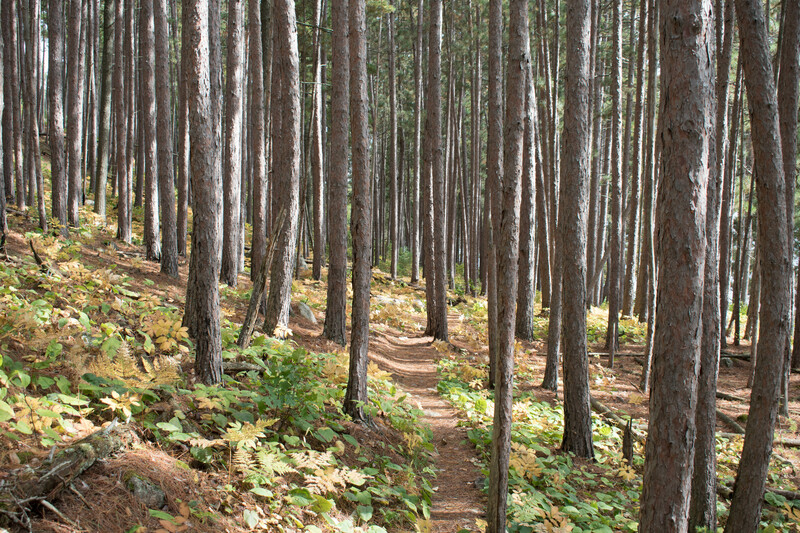 There are several hikes on the mainland, around Rainy Lake visitor center and Ash River visitor center. We hiked Blind Ash Bay trail near Ash River visitor center and the Oberholtzer trail near the Rainy Lake visitor center. Both were decent if not spectacular hikes through the woods and along the lake shore. The scenery at times is fantastic. Look for opportunities even in a seemingly barren landscape, just like ice fishing at Voyageurs National Park in the winter. The essence of Voyageurs is the lake. The history, the ecosystem, the recreation and the wildlife. This is classic North Country, with its hardy people and love of outdoors. The “scenic drive” is by boat and the only proper way to enjoy it is by boat. 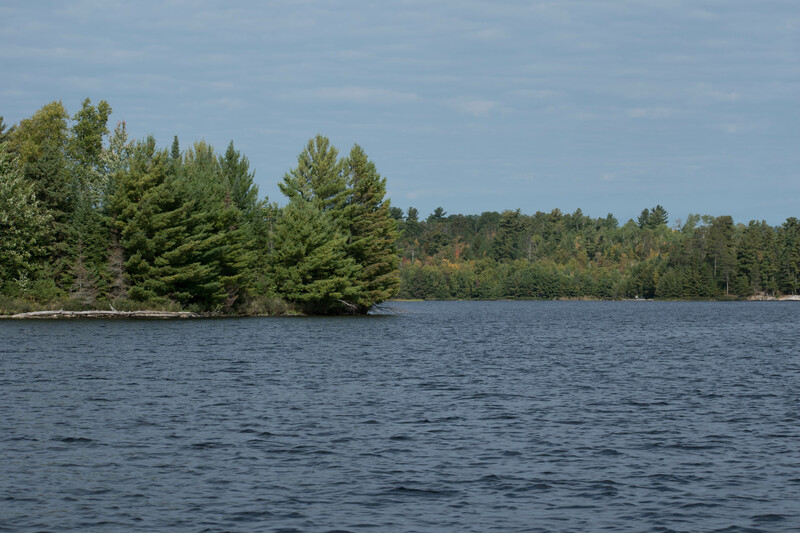 Have you visited Voyageurs National Park? Leave a comment below on your experience. Click on the Follow link and get an email when new postings are available. I will not share your email so no worries. Get on the water! Best way to enjoy this park is on the water. Best time to visit (unless you like winter sports) is late August to mid-September. The bugs will be less of a problem as the weather gets cooler but before it gets too cold. Check park web site for boat tours. There are multiple tours and depending on the season, they run at various intervals. Taking a tour is a must unless you have your own boat. If you can rent a houseboat, that would be an interesting way to spend some quality remote time while being able to move around the lake. During the summer, there are lakeside resorts at Kabetogama for lodging and fun activities. International Falls is the nearest town, with lodging and food, on par with many “gateway towns” near National Parks. Next Post:Wind Cave National Park: Why isn’t it Black Hills National Park? Sidney, I’d heard of Voyageurs, but knew very little about it. Sounds appealing, I’ve added it to our “Bucket List” of things to see in Minnesota post-retirement! (I keep a bucket list for every state, figure I’ll pull it out while we’re traveling through to have a list of interesting sites to visit! ).